After President Trump was elected we saw a boost in optimism in the economy. 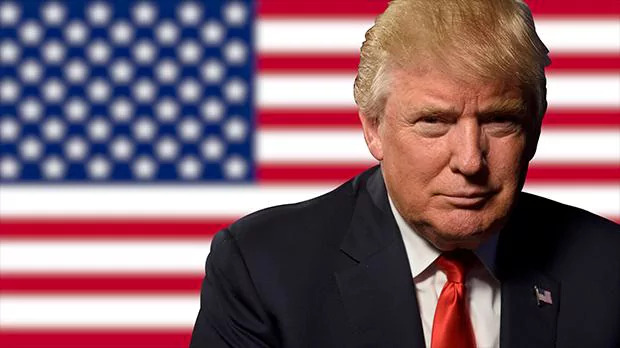 His “Make America Great Again” and “America First” slogans spilled over into investor sentiment and markets rallied based on various pro-growth policies and promises to deregulate the financial industry. After the U.S. elections on Nov. 8, 2016, investors pushed asset prices higher in anticipation of faster U.S. growth relative to the rest of the world, a stronger U.S. dollar, and an improved outlook for small U.S. businesses relative to large ones. Stocks that performed best were those that would benefit from faster growth and rising inflation. This included economically sensitive banks, industrial companies, and energy stocks. Trump’s agenda to cut taxes, increase defense and infrastructure spending, and create jobs pushed the S&P 500 up 5.5% in the first 100 days of his presidency. Unfortunately, those trades began to fade as many market participants appeared to have downgraded the chances that Trump’s legislative agenda would be delivered as soon as they had hoped. Many of these relative trades reversed during the first three months of 2017. The first indication was the failed replacement of “Obamacare.” Adding to the skepticism was rising tensions between the United States and North Korea and mounting concerns over the firing of former FBI director James Comey. The euphoria of President Trump’s proposed policies has been short lived relative to the actual implementation of such an agenda. But not all is lost. There is still optimism that the White House and Congress will be able to achieve a majority of President Trump’s campaign policies, one of those being corporate tax reform: The proposed tax cuts would lower the current income tax rate on businesses from 35% to 15%. Along with the corporate tax cut, a proposed “tax holiday” on approximately $2.5 trillion in cash overseas would encourage corporations to repatriate overseas funds and avoid taxes. Theoretically, that money could then be used for capital investment and job creation. However, there is a possibility that it would only benefit shareholders and not the overall economy through distribution of capital by increasing share buybacks, dividends, mergers and acquisitions, and to a lesser extent, debt repayments. One sector that is expected to be the biggest beneficiary of repatriation of cash held overseas is tech: Apple, Alphabet, and Microsoft have the some of the largest accumulations of cash outside the US. This is one area of the Trump administration that we are looking for further clarity. We believe this could be another catalyst to drive markets higher despite the already elevated valuation levels. But, investing on the hopes and dreams of tax reform could be a longer wait than expected. And even then, the benefits are still uncertain. We would rather take a step back and look at the bigger picture. Yes, we have a bullish tilt on the market if the Trump administration can execute, but there are, in our opinion, many other significant factors influencing the market to which investors should pay attention. To start, global growth expectations are on the rise. As you can see from the chart below, the global economy is experiencing a relatively steady, synchronized expansion. A PMI reading above 50 indicates an expansion and a reading below 50 indicates a contraction. Economic confidence in the Eurozone – a six-year high PMI reading of 56.8 in May – has recently risen as geopolitical concerns eased with the election of Emmanuel Macron in France and for the 19 countries that use the euro currency. Unemployment, currently 9.5%, is also showing signs of coming off historically high levels, as job creation surged to the second-highest mark in nearly a decade as firms expand capacity and meet rising demand. With growth comes the chance for higher inflation. 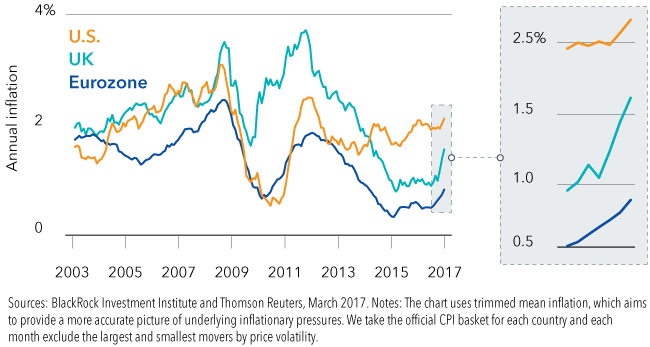 Looking at the chart below, recent anemic inflation rates have started to move higher in the Eurozone, the U.K. and the U.S. Inflation was initially seen as a U.S. phenomenon, where deflation risks in the Eurozone and U.K. caught the headlines. That trend is showing signs of a reversal along with wage growth moving higher. Higher inflation and wage growth is something we are keeping an eye on. Rising wages tend to unease equity investors worried about corporate profit margin being squeezed. If inflation picks up over the remainder of this year and into 2018, higher prices that are not matched by a similar increase in wages will drag down purchasing power, leading to further weakness in profits. 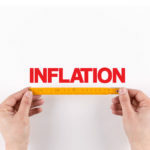 With the changing inflation story and the pro-growth political environment, we have a scenario in which rising rates could be here sooner than expected if inflation begins to rear its ugly head. However, we expect the pace of the Fed to be gradual and we must remind readers that the Fed raising rates is extremely modest by historical standards. While it is easy to get caught up in the ups and downs, we remain focused on the fundamentals of the global markets. 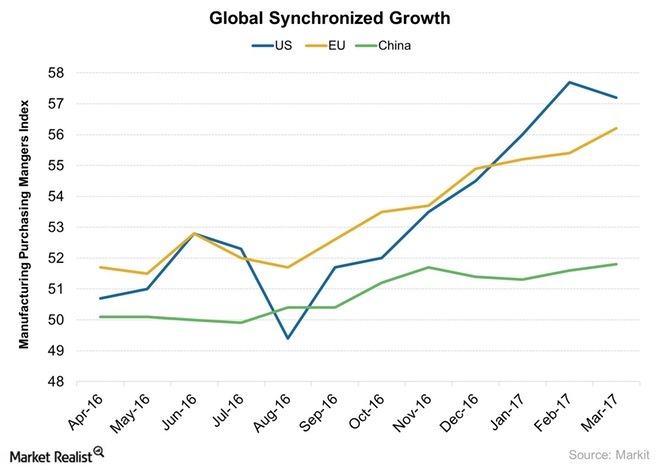 We see a picture that is improving on the back of the broadening recovery and what appears to be synchronized global growth. The Trump Trade has been noise in the grand scheme of things and highlights how markets can overreact to headlines before any real policy is in place. We believe that investors have focused too much on legislation where there is still a wide distribution of possible U.S. policy outcomes and not enough on the resilience of this recovery and the strong underpinnings of growth here and abroad. Should you have questions on your portfolio or would like to discuss the Trump Trade and how to navigate through the headlines, please do not hesitate to contact us.